The following are links to my artwork available on a variety of fine goods. SEND $10.00 USING PAYPAL to wordplay@epix.net and I’ll send you a high resolution image of the “John Langdon” poster below. Purchase fine goods for word lovers at Society6, as well as items here that are not available anywhere else. You can order vast assortment of fine art prints, canvas wraps, tshirts, mugs, iPhone cases and much more at Society6. To see the designs available for purchase, visit society6.com/JohnLangdon. 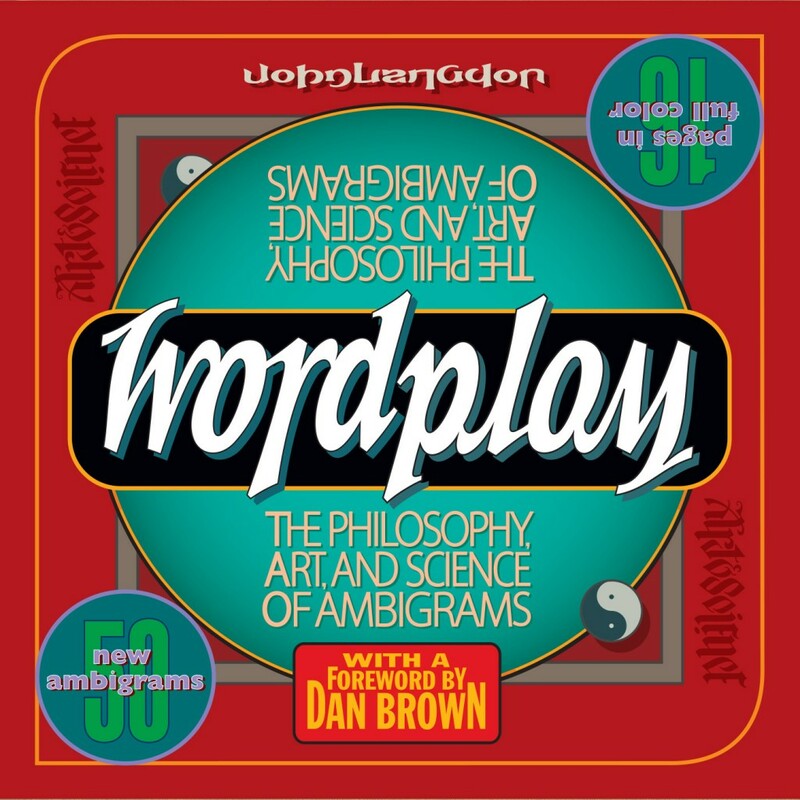 The expanded, revised, and updated 2nd edition of Wordplay was published in 2005 by Broadway Books. In 2005, a second edition of Wordplay was published by Broadway Books, as Dan’s huge bestseller, The DaVinci Code had brought much attention to his earlier Robert Langdon novel, and thus to my ambigram work. 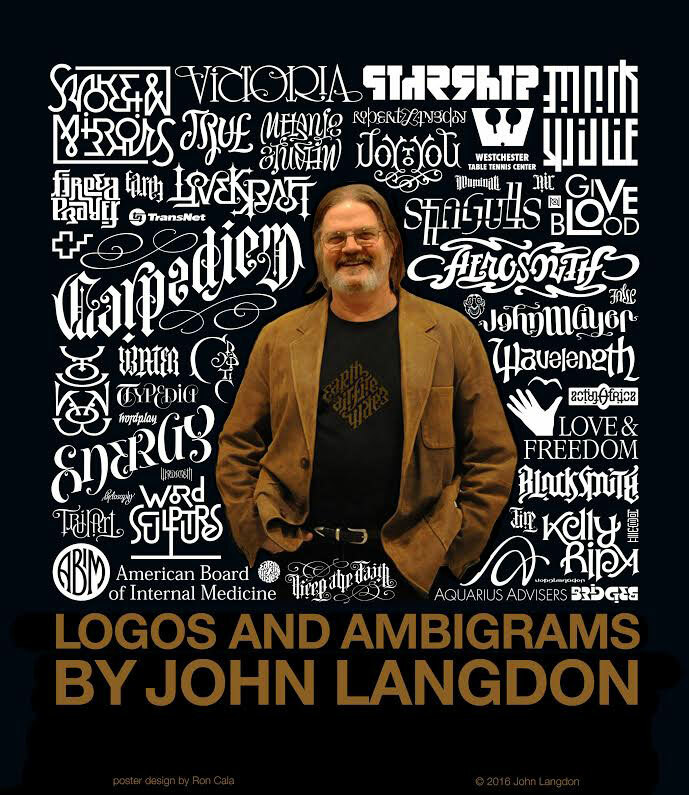 The second edition features many recent ambigrams and a Foreword by Dan. Softcover, 48 pages. Personally inscribed and signed by the artist. Images of 35 paintings. Essay by Miriam Seidel, Contributing Editor, Art in America. $12, including shipping. 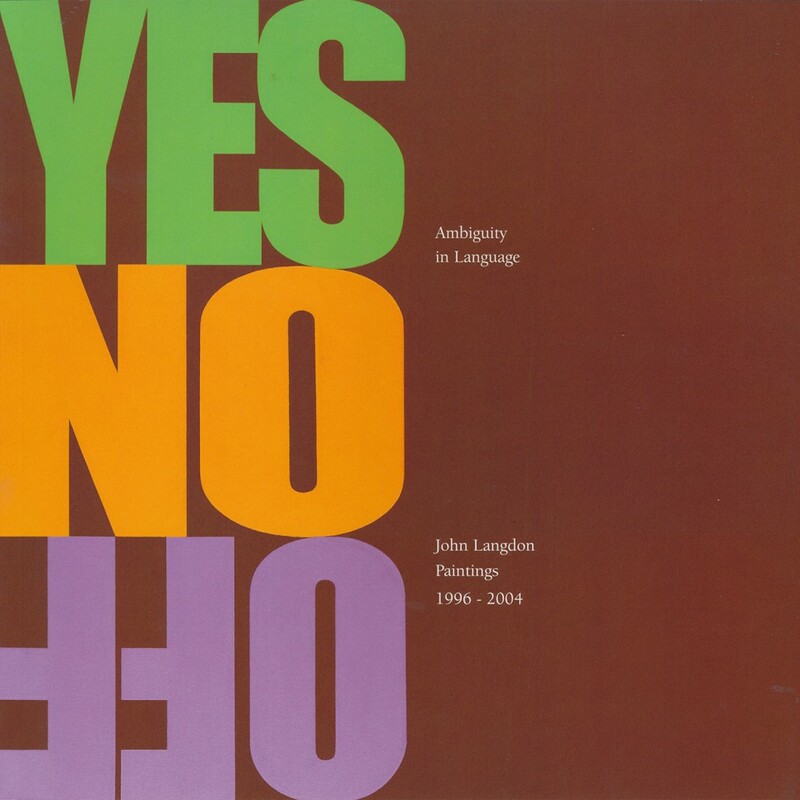 To order simply email wordplay@johnlangdon.net. 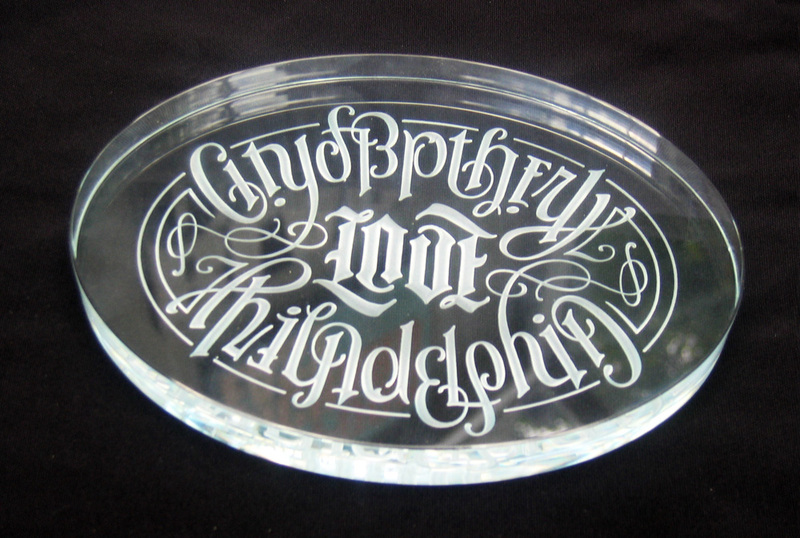 Any of my ambigrams can be etched into heavy crystal clear glass. Lucas Century of Sanibel, Florida does the exquisite glass work. This oval is 4.5″ x 6.5″ x .75″ and weighs approximately 1.5 pounds. I don’t think people need to hold down piles of paper much any more, so this makes an exquisitely beautiful piece of glass art to display on your coffee table, desk or sideboard, where you and your guests can easily glide it 180 degrees to reveal the perfect and re-readable symmetry. The edges are polished, and each piece is hand signed along the edge, using a diamond tipped inscribing tool. $275, including shipping and insurance, in the US. Prices may vary somewhat according to appropriate glass sizes and shapes.